Stimulation at the Newberry EGS injection well began on September 23, and continued for just over three weeks, wrapping up on October 15. 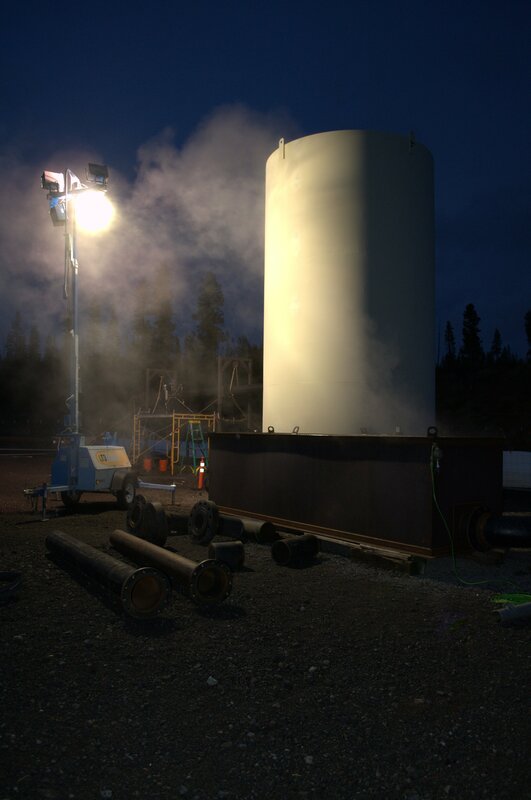 We began stimulation with a step-rate injectivity test, reaching pressures as high as 2,800 psi at the wellhead. We continued to run the pumps at high pressures over most of the stimulation period, reducing the pressure when needed to replace leaky gaskets and valves and inject diverter. 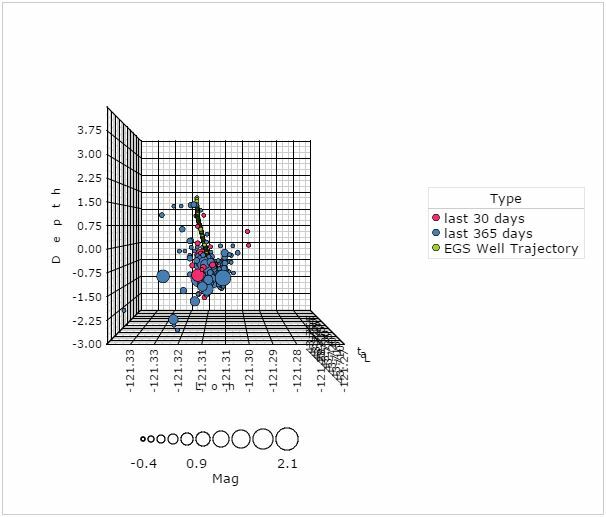 The first microseismic events from stimulation were recorded on September 24 and continued throughout stimulation, totaling over 250 events recorded to date. Microseismic event data is currently being reviewed by seismologists and while we expect some location adjustments, the initial data indicates a robust reservoir was successfully created. Microseismic data is available for your viewing pleasure at the Lawrence Berkeley National Laboratory website and the Pacific Northwest Seismic Network. 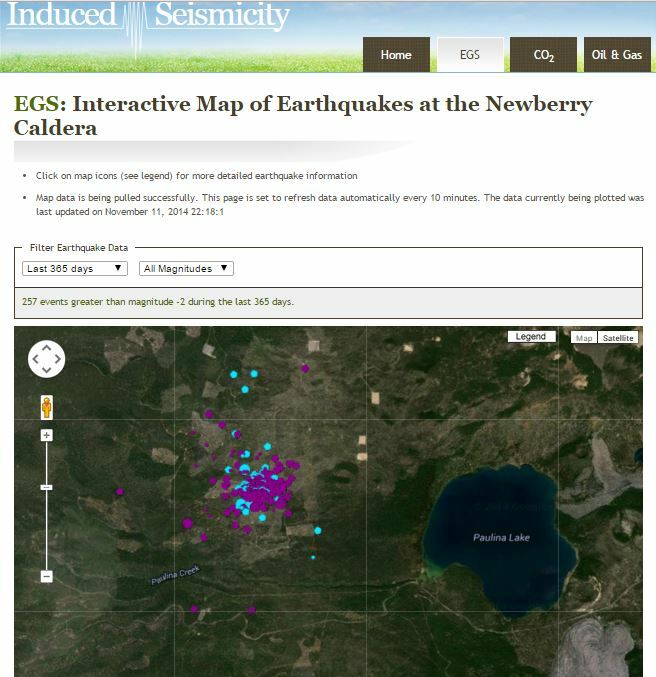 LBNL brings the Newberry EGS Demonstration site to life with an interactive map of microseismic data. A 3-D data plot showing the EGS reservoir. As microseismic events rolled in and pumps continued to run, we prepped for injection of diverter materials (TZIMs). In the past we’ve relied on contractors to provide diverter injection equipment, but this year the engineers at AltaRock got together and designed what we’re affectionately calling the DIVA- a diverter injection vessel assembly. And we’re happy to report that it worked great! See our previous post for a photo of TZIM swirling in the inlet of the DIVA system. A flow test was carried out after stimulation, and water samples were collected for geochemical, isotope, rare earth element and tracer analyses by various research groups involved with the Newberry project. Results from these tests will help us better understand reservoir characteristics in greater detail. Over the day and a half long flow test, over 30 samples were collected for various analyses. Hot water and steam from the reservoir are piped into the separator cylinder and through the weir box during the flow test. Distributed temperature sensing (DTS) cable and pressure temperature spinner (PTS) survey data indicate six major connection points between the reservoir and the well bore. Over the past three weeks, we analyzed data and developed a plan to further improve reservoir connectivity to the wellbore. The second stage of stimulation for 2014 will run from November 11-21. We will report on those results in the next post. The Bureau of Land Management has produced and released a new video about the Newberry EGS Demonstration project. The video was shot in early summer, 2014, just before field activities began at the site. In addition, the Bend Bulletin did a story on the project during the stimulation and shot a video. Enjoy!